Keeping your baby's bottles clean and sanitized is imperative for their health. Drying bottles on towels can allow condensation to accumulate and prevent them from drying completely. Using a drying rack can help you save counter space and ensure that your bottles dry completely before your next use. We've picked 5 of the best bottle drying racks to help you decide which one is best for you. First and foremost, you want to find a bottle drying rack that will fit enough bottles and accessories for your needs. Some racks have multiple tiers to make the most out of your counter space. Others are fairly small but still suitable for half a dozen bottles and accessories. Look for a drying rack that is free from harmful chemicals like BPA, which has been linked to health issues especially in infants and children. Some bottle racks are also free from phthalates, which may have significant side effects on reproductive health. Keeping your bottle rack clean is essential; after all, there's no point in putting clean bottles onto a dirty rack. Some bottle racks are top rack dishwasher safe, making it easy for you to keep it clean and free of mold or mildew. Others must be hand washed with warm, soapy water. While it's essentially a matter of personal preference, the ability to wash in the dishwasher is an added convenience. For the accessory-loving mom, this drying rack from Munchkin can hold up to 16 bottles as well as valves, straws, pacifiers and more. The two-tier design is complete with 16 pegs that can fold down for easy storage. Both tiers spin, although some users found that the bottom rack was harder to rotate than the top. The top rack can be brought up or down to adjust the height to accommodate smaller or larger cups and bottles. It can also be completely detached to store away when not in use. A reversible dip tray on the bottom of the rack can be set to either collect water or drain directly into the sink. To collect water, leave the tray pushed in; pull the tray out to drain into the sink. For easy cleaning, all pieces are top rack dishwasher safe. It is BPA, phthalate, lead and latex free. The stylish, low-profile design of the Philips AVENT drying rack is great for practically any kitchen space. Made of a base with dip tray and four "branches," this tray holds up to 8 bottles plus additional accessories. The branches can be detached and adjusted to accommodate your specific needs. The bottom tray easily detaches to empty water as it collects. Each piece is top rack dishwasher safe, so keeping it clean and mold-free is a breeze. It takes up very little counter space, especially when compared with some other drying racks. Despite its low-profile stature, most users found that it was more than sufficient to hold all of the bottles they needed to dry. The OXO drying rack fits at least 8 disassembled bottles and parts, keeping your counter clutter-free. It's available with green or orange accents so you can fit it into your kitchen's existing color scheme. The base has a section with flexible tines to hold bottles upright, as well as an open space with ribs to dry small parts. It also has a removable cup for medicine droppers, straws and utensils. Water is collected in deep walls on the base, and the rounded corners make it easy to empty water as it collects. Unfortunately there is no spout or hole for the water to drain directly into the sink. The rack is top rack dishwasher safe. Users said that it held up well over time and never developed mold or mildew even with regular use. The vertical design of this First Years drying rack is optimal for making the most of limited counter space. With enough room for up to 16 bottles plus additional accessories, it's a great design for moms with limited counter space. Bottles fit easily on the pegs while accessories can be placed directly onto the spinning tiers. A removable dip tray at the base can be used to collect water as it drains, or the rack can be placed near the sink to drain directly into it. The top tier can be brought up or down to accommodate large or small bottles on the bottom rack. The whole unit is top rack dishwasher safe for easy cleaning, and it's BPA-free for safe drying. 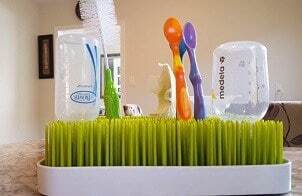 The cute grass design of the Boon countertop drying rack is a fun way to addition to any countertop. Bottles and accessories can be placed onto the flexible "grass" blades to air dry. Water collects in the lower tray, which can be detached, emptied and cleaned as needed. The Boon drying rack can be outfitted with different accessories to accommodate additional bottles and pieces. Each accessory fits in with the grass theme: choose from a flower bud, twig, stem and butterfly. Boon recommends washing thoroughly before initial use and periodically as it is used. It must be hand washed in warm, soapy water. It is not dishwasher or microwave safe. Most found the size to be sufficient for their bottles and accessories, measuring 9.5x9.5". A few users complained that it was too small, but extra room can be added with the optional accessories. This rack is free of BPA, phthalates and PVC, so it's both cute and safe. Munchkin's ﻿﻿high ﻿﻿capacity bottle drying rack is our number one pick, thanks to its ability to hold up to 16 bottles and accessories, as well as its convenient design and dishwasher-safe materials. 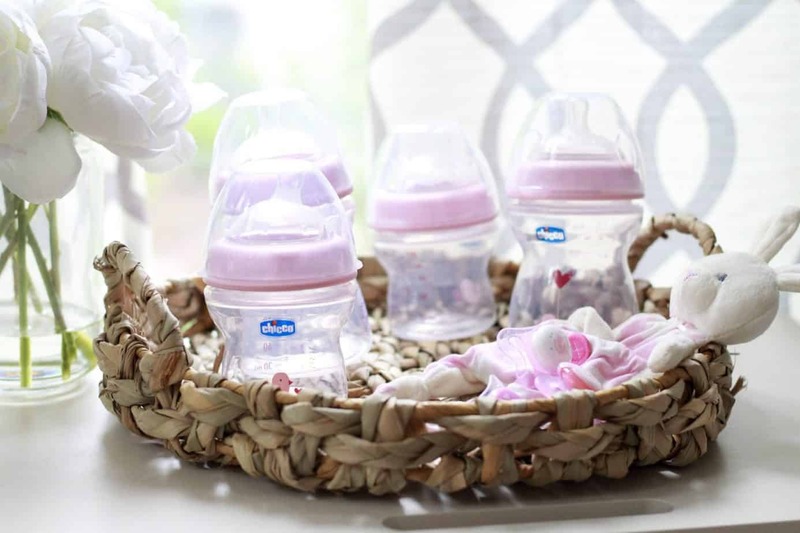 It's also free from BPA, phthalates, lead and latex so you can rest assured that your baby's bottles aren't coming into contact with any harmful materials.